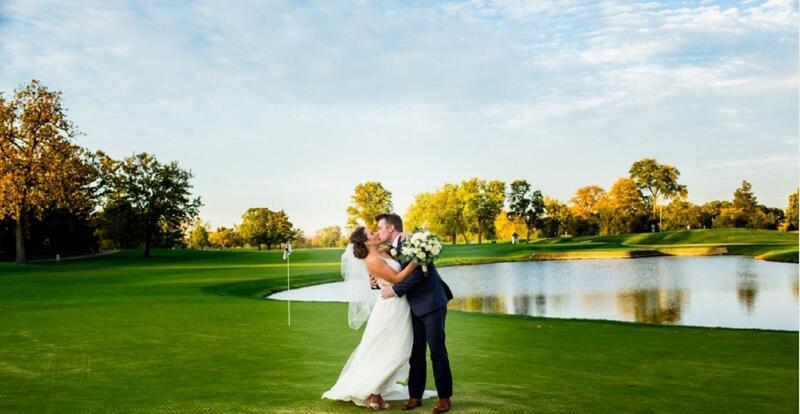 "Distinctive Weddings - One at a Time"
Our staff at Cog Hill welcomes the opportunity of hosting your wedding reception. We take great pride in our food and the service we provide our guests. We feel strongly that our people make the difference. We understand the trust and responsibility that is conveyed to us in handling your special event. Your choice of where to hold your reception is an important one; we hope the following information will help. The club opened in 1927 and since then we have done thousands of weddings – one at a time! We stay focused on you. One wedding, one couple, one menu, one set of timetables – no cookie cutter weddings here! We want and need your input to make this an event we will all be proud of. Your stage is our “old world” style clubhouse with its massive beams, 30 foot ceiling, leaded windows and stone fireplace. Seating capacity up to 280. From your initial meeting to your last dance, we strive to make every wedding a unique and memorable experience. Cog Hill books only one wedding per night. Exclusive use of the entire main floor, including private bar and patio. Entrée including fresh rolls & butter, soup, salad, sorbet, starch, vegetable, ice cream served with your cake, and coffee. White glove table service. 32:1, guest server ratio. Four hour premium bar, featuring “call brands”, cream drinks,a large selection of imported and domestic beers – draft and bottled. We provide one bartender for every 50 guests – no lines here! On site ceremony location available for an additional charge. Please see our "Wedding Packages" for additional information and menus. Call 866.COG.HILL (264.4455) x301 and let our wedding managers make the wedding of your dreams become a reality!